By dictionary definition the word ‘traditional’ means ‘long-established’ - a term not only applicable to Broadway Kitchens as a company but also to the traditional values and craftsmanship that it uses to create bespoke kitchens for customers. Of course what each person considers a 'traditional kitchen design' will depend on their age, background or lifestyle. It can mean anything from natural wood, painted wood, a Shaker kitchen or Edwardian elegance to an opulent and ostentatious Victorian kitchen. More-traditional kitchens have doors that are set within a frame (hence the term in-frame) whereas the average kitchen of the 1970s and 80s will have doors covering the whole frontage of the cabinet or carcase. It is of course possible to fuse the two methods of construction to meet style and budgetary considerations. 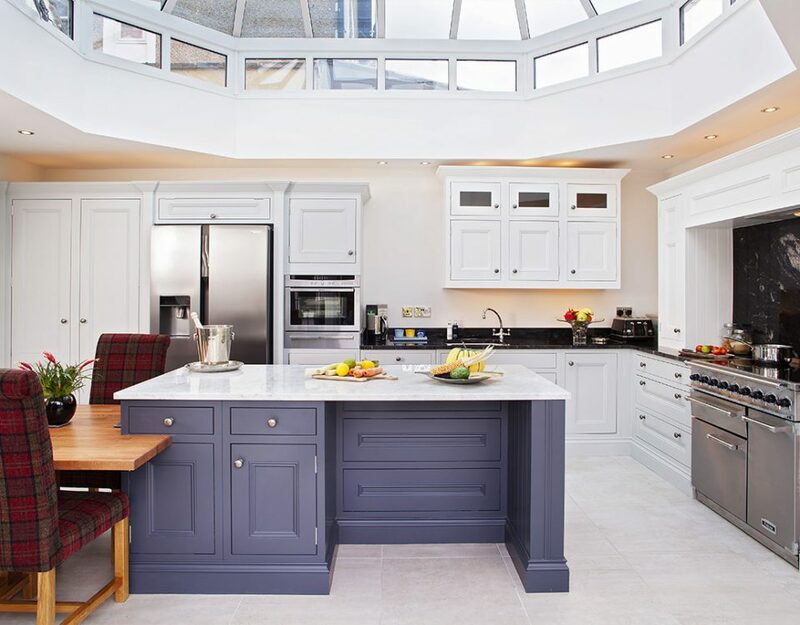 Today, as the kitchen has become the essential focus of family life, bespoke handmade, hand-painted, luxury kitchens of the finest quality, in natural colours, are high on the popularity list with complementary modern appliances and materials for worktops, islands and flooring. With both fitted and unfitted kitchens changing in function and style over the decades they no longer comprise purely a sink, cooker, draining board and a ‘cup-board’; they are a multi-functional focus for activity in the home. Consequently they tend to be much larger with space for lengthy worktops, islands and comfy sofas plus all the appliances of modern living like fridges, freezers, microwaves, steam ovens, coffee machines, dishwashers, washing machines and wine coolers. In traditional barn kitchens and farmhouse kitchens rustic colours or pastel shades are used to complement profiled doors and worktops with angled cabinetry and other detailed design features on island units and free-standing dressers. Curved doors and worktops are just as stylistically at home in natural real wood kitchens or modern kitchens with high gloss finishes. Both styles often employing a complementary colour scheme of walnut and cream or soft white and dark anthracite, even several shades of grey. Such styles and fashions are cyclic in clothes, cars and kitchens so both styles of painted wood kitchens and high gloss kitchens are now every bit as popular as a traditional painted Shaker kitchen or traditional farmhouse kitchen. So often the final kitchen design is a fusion of styles and colours picking the best from many eras. Whatever a customer’s concept of a traditional home kitchen a true 'manufacturer' like Broadway can meet their design criterion and turn their kitchen design ideas and dreams into reality at a price to meet their budget and lifestyle. Traditional Victorian Kitchens or Edwardian Kitchens? Which style is right for me and my home? The vast majority of people today hanker after kitchen styles reminiscent of a bygone, more-affluent era rather than trying to imagine a future style that will endure and not rapidly go out of fashion. The age of the property and the social status of the occupant will traditionally have dictated the size or style of the kitchen in a traditional home and the scope for making a social statement still exists in the same way that the Victorians liked to visibly display their wealth. This constitutes the bulk of the market for ‘traditional kitchens’ where customers are prepared to pay a reasonable sum for craftsmanship with unique and exclusive features to reflect their style and taste. Victorian-style traditional kitchens of elaborate, fancy, ornately carved corbels, pilasters, cornices, pelmets and architraves with intricately detailed acanthus leaves and free-standing kitchen furniture gave way to the plainer Edwardian kitchens with stylised shapes of ‘hearts and flowers’ but still displaying detailed shape and form. Glass-fronted Victorian kitchen dressers to display your worldly goods and floral crockery saw themselves replaced by Edwardian kitchens of understated elegance and the period of Victorian bling was over. The lengthy Victorian era was succeeded by a decade of Edwardian style where sideboards became the order of the day and the ‘element of surprise’ came with opening a cupboard door to reveal the secrets and riches within. Gone was the Victorian kitchen where all the pots, pans and cooking implements were on public display - in came the simple but elegant, not quite ‘Shaker’, but hand-painted kitchens with colour to celebrate a new era. Natural Wood or Painted Traditional Kitchens? Handmade real wood kitchens also came into vogue with lighter coloured woods like elm and fresh oak taking the place of dark mahogany and black-lacquered Victorian furniture. So entrenched was the elaborate opulence and showiness of the late Victorian era that early Edwardian style retained many design clues from the earlier six decades of the Victoria era. 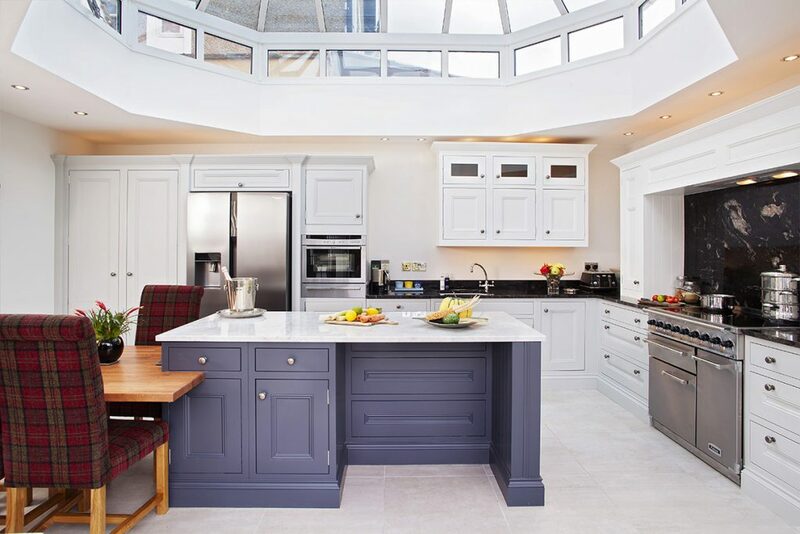 Consequently the boundary between Victorian kitchens and Edwardian kitchens is significantly blurred but the important aspect of good kitchen design is often to take design clues from the architecture of the home itself. Tasteful styles reflecting the architectural statement of the property itself almost always return and it is usual that the design of a new kitchen will pay homage to the style and era of the property even if the style of home spans more than one era. 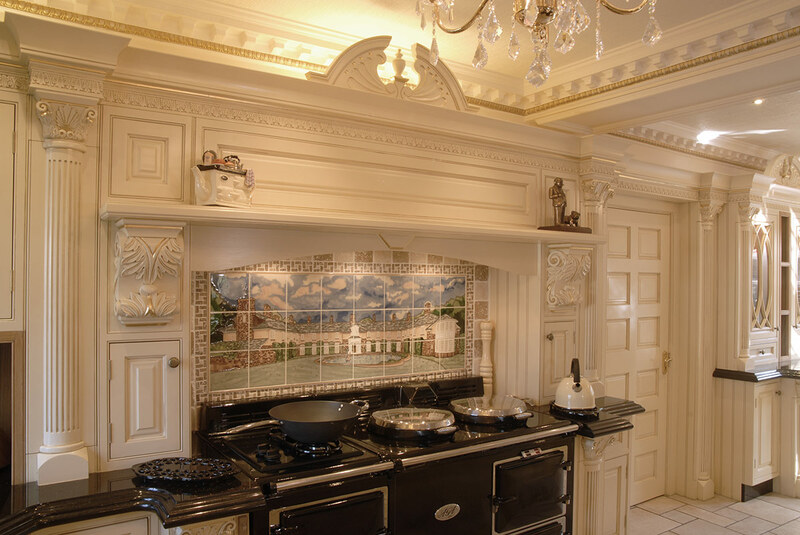 To ensure that a traditional kitchen is contemporary with the house and complementary to its design features Broadway Kitchens often re-creates the pattern of ceiling cornices and roof pediments in the cornices, mantelpieces and pelmets of fitted kitchen furniture whether plain, stylised or elaborate. 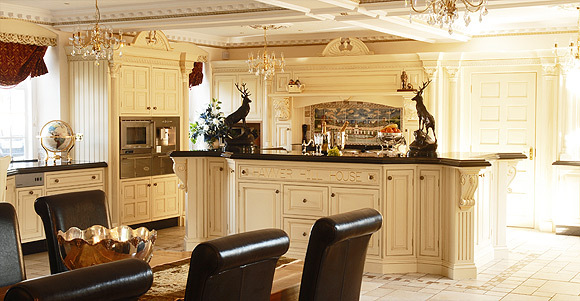 Similarly, as a company manufacturing kitchens from raw timber on its own machines, it is easily within Broadway’s in-house capabilities to copy the panels and style of original house doors to create a truly bespoke kitchen which is fully functional for the lifestyle of the purchaser whilst being totally sympathetic to the property and enhancing its value. It is fair to say that most styles, whether they be in clothing, furniture or colours, tend to reappear every 30 years so it is no surprise to discover the same resurgence in classic hand-painted kitchens. Each re-appearance of a colour palette usually heralds a modern twist in thinking so the muted pastel colours and hues of the earth, air and sky first seen in Edwardian painted kitchens of 1910 were brighter when they resurfaced in the 1940s, yellower in the 1970s and now more true to their original Edwardian shades. Looking back at the origins of painted kitchens we see that the sombre ‘below stairs’ mahogany and dark wood kitchens of the Victorian era were poorly lit by gas or candle. Any daylight only came from windows placed as high as possible to allow best escape for the hot air, steam, smoke and cooking odours while maximising available wall space. Much of the fitted and unfitted solid wooden kitchen furniture had probably seen better days, battered and bumped with use, dark and dingy but a new era of light had dawned. The dark, rich tones of kitchen cupboards successfully hid the soot of oil lamps and tallow candles but gas lighting showed every mark and blemish. 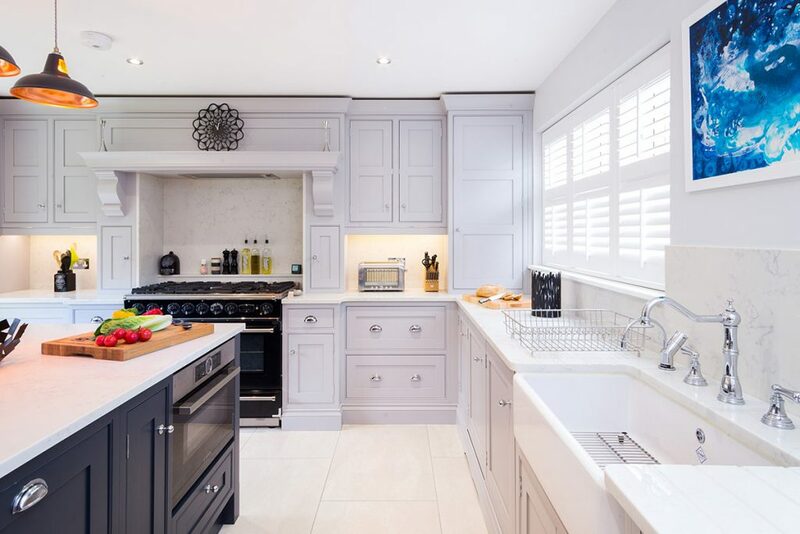 Subtle shades of cream, blues, greens and greys added light and colour to the dull, darkness of hand painted kitchens while choosing matt or eggshell finishes hid the blemishes whereas reflections in gloss paint would have exaggerated every bump, fingerprint and discrepancy. Much of the aspirational fashionable taste was inspired by the grand kitchens in stately homes around the country like Shugborough near Stafford, Ickworth in Suffolk, Berrington Hall in Herefordshire, Dunham Massey in Cheshire and Palace of Holyrood in Edinburgh. Leading the fashion field and generating style statements has always been the domain of enclaves of elegant housing with large luxury kitchens in the ageing suburbs of London, Leamington Spa and Birmingham. Like the dining habits of those upstairs/downstairs days of yore the names of current paint colours like Smoked Trout, Dead Salmon and Breakfast Room Green, aptly encapsulate life at the kitchen table. Others like Mole’s Breath, Calamine, Arsenic, Sudbury Yellow, Charleston Gray and Nancy’s Blushes conjure up images of the landed gentry with estate landscapes from Petworth in West Sussex and Cragsdie in Northumberland to Erddig in Wrexham. A drop of ‘laundry blue’ in the white distemper for walls repelled flies and brightened the atmosphere whilst complementing the natural earth colours of London Stone, Oxford Stone, London Clay and Terracotta applied to tailor-made fitted kitchen cupboards and dressers. The art of hand painting kitchens was in great demand as luxury kitchens in normal domestic situations were in use by the householder’s family rather than purely the domestic servants of grander homes. Investing in a quality traditional kitchen is as important today as it has been for the last 200 years. Broadway has been creating beautiful traditional kitchens for over 40 years, are a proud family business and genuinely care for our customers' needs. 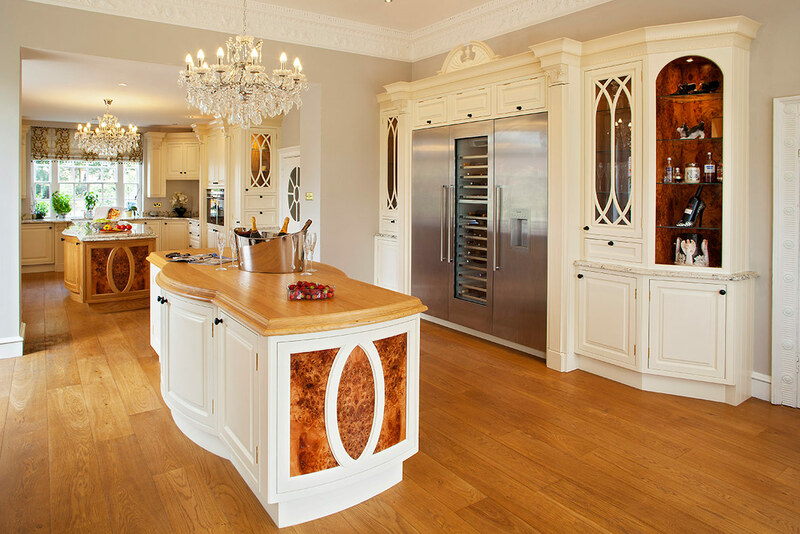 Broadway's bespoke traditional kitchens are designed to give you and your family decades of pleasure. We design, build and install traditional kitchens all over the UK, particularly Birmingham, East and West Midlands, Staffordshire, Derbyshire, Warwickshire, Worcestershire, Leicestershire and Nottinghamshire. Call us for a friendly chat on +44 (0) 121 353 4999.